Generates basic statistics for a field of the attribute table of a vector layer. Numeric, date, time and string fields are supported. The statistics returned will depend on the field type. Statistics are generated as an HTML file and are available in the Processing ‣ Results viewer. Vector layer to calculate the statistic on. Any supported table field to calculate the statistics. HTML file with calculated statistics. Takes a point and a polygon layer and counts the number of points from the first one in each polygon of the second one. A new polygons layer is generated, with the exact same content as the input polygons layer, but containing an additional field with the points count corresponding to each polygon. An optional weight field can be used to assign weights to each point. Alternatively, a unique class field can be specified. If both options are used, the weight field will take precedence and the unique class field will be ignored. Polygon layer whose features are associated with the count of points they contain. A field with numeric-like values from the point layer. The count generated will be the sum of the weight field for each point contained by the polygon. Points are classified based on the selected attribute and if several points with the same attribute value are within the polygon, only one of them is counted. The final count of the points in a polygon is, therefore, the count of different classes that are found in it. The name of the field to store the count of points. Resulting layer with the attribute table containing the new column of the points count. Clusters point features based on a 2D implementation of Density-based spatial clustering of applications with noise (DBSCAN) algorithm. The algorithm requires two parameters, a minimum cluster size, and the maximum distance allowed between clustered points. Minimum number of features to generate a cluster. Distance beyond which two features can not belong to the same cluster. 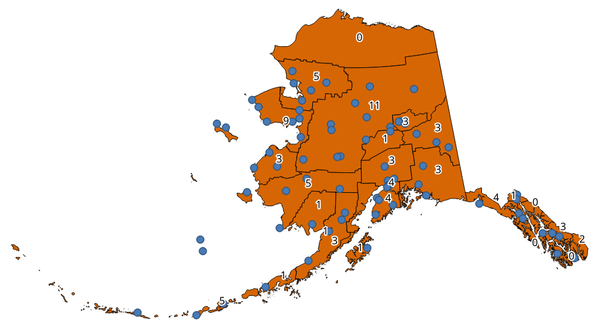 If checked, points on the border of a cluster are themselves treated as unclustered points, and only points on the interior of a cluster are tagged as clustered. Name of the field where to store the associated cluster number. Vector layer containing the original features with a field setting the cluster they belong to. Calculates for point features distances to their nearest features in the same layer or in another layer. Point layer for which the distance matrix is calculated (from points). Field to use to uniquely identify features of the input layer. Used in the output attribute table. Point layer containing the nearest point(s) to search (to points). Field to use to uniquely identify features of the target layer. Used in the output attribute table. 0 — Linear (N * k x 3) distance matrix: for each input point, reports the distance to each of the k nearest target points. The output matrix consists of up to k rows per input point, and each row has three columns: InputID, TargetID and Distance. 2 — Summary distance matrix (mean, std. dev., min, max): for each input point, reports statistics on the distances to its target points. You can choose to calculate the distance to all the points in the target layer or limit to a number (k) of closest features. Default: 0 — all the points are used. Point (or MultiPoint for the “Linear (N * k x 3)” case) vector layer containing the distance calculation for each input feature. Its features and attribute table depend on the selected output matrix type. Creates lines that join each feature of an input vector to the nearest feature in a destination layer. Distances are calculated based on the center of each feature. Vector layer for which the nearest feature is searched. Vector layer containing the features to search for. Field to use to uniquely identify features of the destination layer. Used in the output attribute table. Line vector layer with the attributes of the input features, the identifier of their closest feature and the calculated distance. Creates a point layer representing the center of the input features with the addition of two fields containing the identifier of the nearest feature (based on its center point) and the distance between the points. 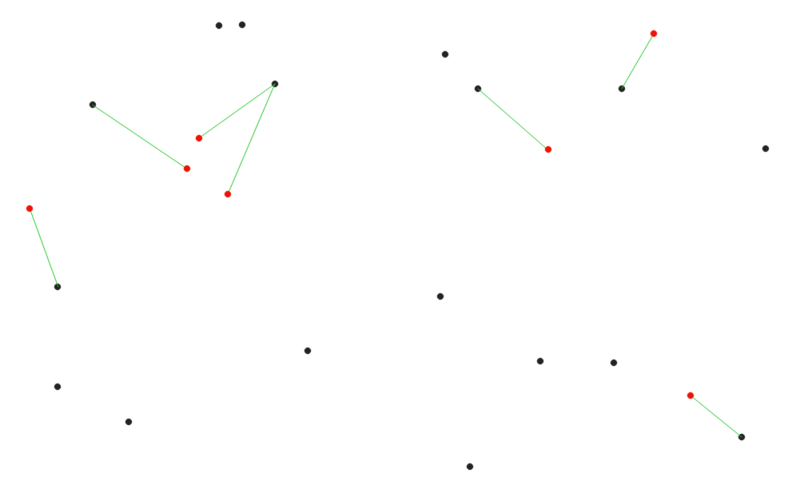 Point vector layer with the attributes of the input features, the identifier of their closest feature and the calculated distance. Creates hub and spoke diagrams by connecting lines from points on the spoke layer to matching points in the hub layer. Determination of which hub goes with each point is based on a match between the Hub ID field on the hub points and the Spoke ID field on the spoke points. If input layers are not point layers, a point on the surface of the geometries will be taken as the connecting location. Field of the hub layer with ID to join. Choose here the field(s) of the hub layer to copy. If no field(s) are chosen all fields are taken. Field of the spoke layer with ID to join. Field(s) of the spoke layer to be copied. If no fields are chosen all fields are taken. Calculates the 2D distance based k-means cluster number for each input feature. K-means clustering aims to partition the features into k clusters in which each feature belongs to the cluster with the nearest mean. The mean point is represented by the barycenter of the clustered features. If input geometries are lines or polygons, the clustering is based on the centroid of the feature. 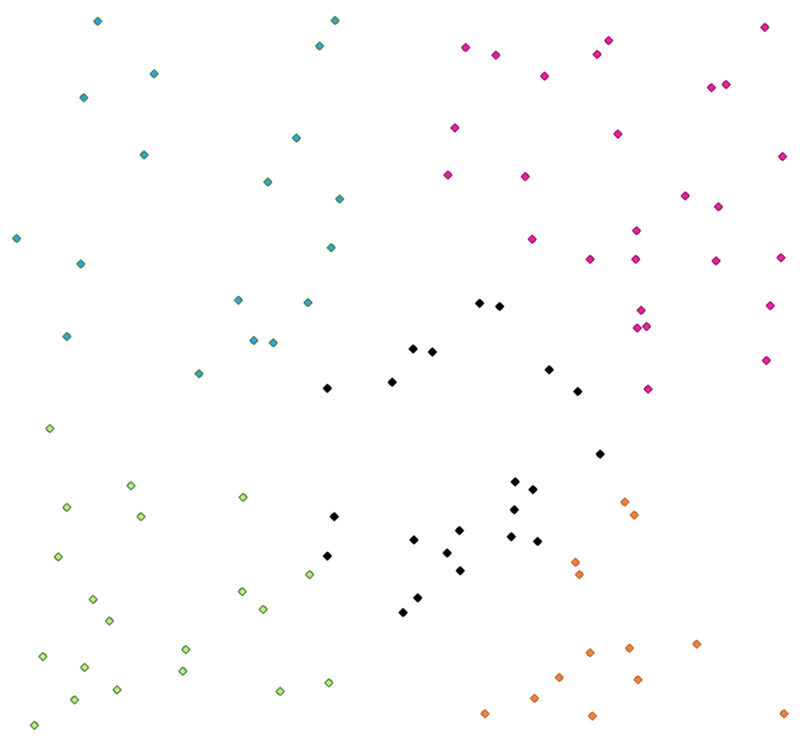 Number of clusters to create with the features. Lists unique values of an attribute table field and counts their number. Summary table layer with unique values. HTML report of unique values in the Processing ‣ Results viewer. Computes a point layer with the center of mass of geometries in an input layer. An attribute can be specified as containing weights to be applied to each feature when computing the center of mass. If an attribute is selected in the parameter, features will be grouped according to values in this field. Instead of a single point with the center of mass of the whole layer, the output layer will contain a center of mass for the features in each category. Field to use if you want to perform a weighted mean. Unique field on which the calculation of the mean will be made. Performs nearest neighbor analysis for a point layer. Point vector layer to calculate the statistics on. HTML file in output with the computed statistics. Calculates statistics of fields depending on a parent class. Input vector layer with unique classes and values. If empty only the count will be calculated. Takes a polygon layer and a line layer and measures the total length of lines and the total number of them that cross each polygon. The resulting layer has the same features as the input polygon layer, but with two additional attributes containing the length and count of the lines across each polygon. The names of these two fields can be configured in the algorithm parameters. Name of the field of the lines length. Name of the field of the lines count. Polygon output layer with fields of lines length and line count.